Make a fellow traveller happy! Looking for that special treat, birthday present or last minute present? 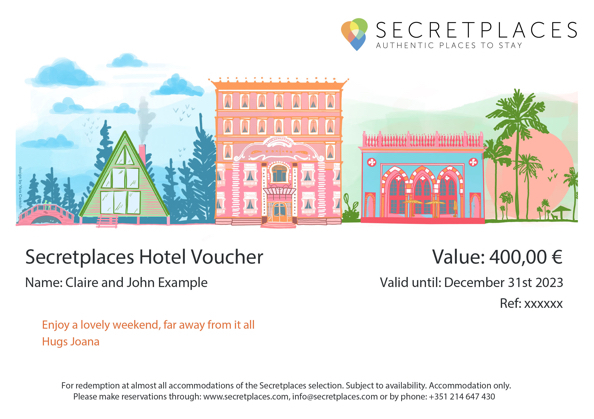 Why not make the most of the special Secretplaces Voucher. It can be redeemed at over 1.350 of our beautiful and stylish hotels and accommodations, so there’s plenty from which to choose from. For more information on how to pick up your hotel gift vouchers, email us or call on +44 203 286 4643, +351 214 647 430 (P), +34 902 430 310 (E) or +49 89 809 109 34 (D). Alternately, simply fill in the details below, pay the chosen amount by PayPal and receive our voucher by e-mail.